Mondays are always hard, but even harder after you have been away for a week. But I am back and chugging coffee like it is my lifeline. We got back from Graeagle on Friday afternoon and still had the weekend ahead of us. That was some great planning there. I will recap our trip sometime this week, but in the meantime, I will recap our weekend. Friday after we got back from vacation, we did a bunch of laundry, gave the girls a bath, unpacked and settled back into life after vacation. We got takeout that evening (salads after eating a bunch of food all week), caught up on some shows and went to bed early. Saturday morning we headed out to breakfast since we had nothing in the house. I didn't eat much other than a scone and latte since I had lunch plans with friends. I met up with my friend April who came into town from LA, her sister and my friend Brandy for lunch. We got to catch up and it felt amazing. After lunch, I did some grocery shopping and came home to hang out with the girls while Rory did some yard work. At 5, my friend Heather picked me up and we headed to the Reno Rodeo while Rory took the girls to In N Out for dinner. 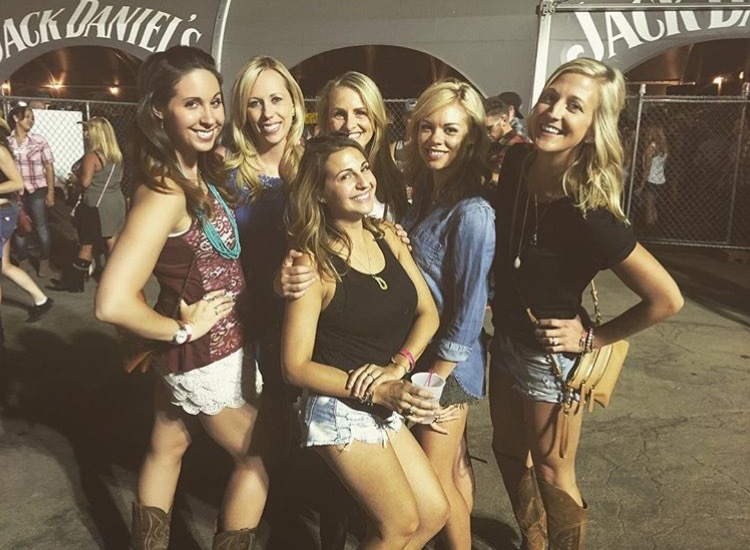 We watched the rodeo, had lots of drinks, caught up and danced in the Jack Daniels tent. It was a lot of fun, but I realized how old I feel now. So many people in the JD tent are in their early 20s. But it was still so much fun. I took an uber home and made it home by 11 pm. That was late enough for me! I can't wait to do it again though. Girls night! Sunday we got up and headed to breakfast and I was surprised I wasn't hungover. After breakfast we took a long walk since we wanted to get it in early with temperatures in the high 90s this week. After naps, we took the girls to the Discovery Museum. We have never taken the girls there, but it was recommended once they could walk. It was a lot of fun, but I would recommend waiting until your children are 2 years old that way they can do more stuff. The girls had a blast in the Little Discoveries area and even the other areas. They just couldn't reach everything, so it would be a bit easier when they get older. We plan to get a membership there once they are 2. They fell in loves with slides last week during vacation and now want to go on them whenever they see one. After the museum, we took the girls home for naps before their grandparents came over for a visit. My parents played with the girls while we all caught up on vacation and what the girls have been up to. After they left, we fed the girls, bathed them and played for a bit. Then we put the girls down and I made dinner. We capped off the night with the season finale of Silicon Valley and went to bed early. It was a good weekend, but way to short. And now we are back at work and back at it. glad you got to end your week with a fun girls night. Haha it is and it is strong!!! It was a really fun time with my friends. It is so nice to have a girls weekend. They don't happen enough. Monday is rough, but I am surviving. So nice that the fun didn't stop once you got home from vacation! That rodeo sounds so neat. That is very true and a good way of looking at it. The rodeo is so much fun here. Where did you get their jellies? what size do they wear? I got them from Old Navy and they are in the 18 to 24 month ones since the size 5 were too big (weirdly enough since that is the size they are wearing now). What an amazing weekend!! That rodeo looks like so much fun! And I'm soooo jealous of you west coasters and your In N Outs!! Gosh, I wish we had them around here! Can't wait to hear about your trip! Hope your first day back to work is going well! The rodeo is tons of fun. Lots of activities and things to do. Plus all the food and drinks. In N Out is amazing, but I wish I had Chick Fil A here. Soon. First day back is ok, but I wish I was still relaxing! Sounds like a great weekend! Hoping your day is going fast! Can't wait to hear about your trip! It was a lot of fun. My day is flying right now and I can't wait to break up the day with some gym time. Have a good day Amy! So smart to have the weekend once you got home. The rodeo looks so fun. The girls on the saddle photos are priceless. Can't wait to hear all about the trip. It is something I wish I did more often, but most of the time we go back to work right after vacation. The rodeo was a lot of fun. Probably too much fun! Wow! What a fun and packed weekend. Gotta love getting together with the girls for some fun! Yippee!! The rodeo looks like a blast. I love a good rodeo. And the discovery museum looks like fun. We love the one near us too. What a great weekend! You're always having so much fun with your family! In n out....oh man I miss it!! Jealous of your girls' lunch and girls' night! So fun! It looks like the girls enjoyed themselves at the museum even if there wasn't a ton for them to do. The toddler stage between 1 and 2 is tough because kids want to explore but there aren't many places geared toward that age.